So, had a night out at the Capri Drive-In in Coldwater, Michigan, over the weekend, a fact that was previously mentioned in a post here and my choices were either Despicable Me 2 and Monsters University, or The Lone Ranger and World War Z. Having never seen the first Despicable Me, and only marginally interested in Monsters U, I chose the other screen. The Lone Ranger. I’ve said it before about most other movies I’ve seen, and it is a fact that applies to this one — too long. Usually I think ten minutes is a good number to remove from a movie to make it better but here it easily could’ve been twenty-five. Bloated doesn’t even begin to describe it. 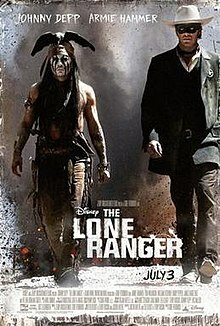 Oh, and why is it called The Lone Ranger when it’s clearly the story of Tonto and his white friend, The Ranger? Anyway, say it with me together now: Enh. World War Z. There are basically two genres of zombie movies anymore: the quick zombies and the slow zombies. 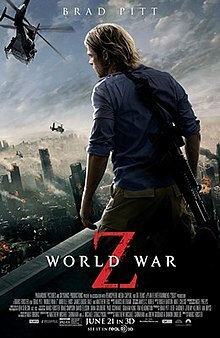 I’ve never really been a fan of the quick zombies — I’m much more partial to the slow, lumbering zombies — but of the genre, World War Z is not bad at all. Given it’s production problems, I expected a mess and at points, it is sloppy and episodic. But on the whole, it was smarter than expected, had a fairly surprising non-slasher movie ending, and was completely unafraid to screw with audience expectations. After all, right about the time Brad Pitt and the plane touches down in Korea with brilliant doctor, who was being set up to be the genius savoir of humanity, I said to my daughter, who was watching with me, wouldn’t it really screw with the audience if the doctor was bitten straightaway and died? No sooner were the words out of my mouth than he did die (from an accidental self-inflicted gunshot wound, but still). Any other movie not Zak Snyder’s Dawn of the Dead, which was awful. Both times I’ve been to the Capri a movie with Armie Hammer was featured: last year it was one of the Snow White movies (whichever one he was in that came out last year) and this year it was The Lone Ranger. Not sure what he’s in next so no telling if I can keep the streak alive. Just blasted through both seasons of Party Down on DVD — well, maybe not blasted, as it took me a week or so to get there — and even though I know the ending of the show was enforced by cancellation and the loss of Jane Lynch to Glee and Adam Scott to Parks & Rec, I kind of think the ending of the show is perfect. After all, if it were to have gone to another season you’d know how Henry’s audition for that movie turned out, whether he got the part or not. But because it ended as it did you’re left to draw your own conclusions about the outcome and fortunately one of the conclusions is that Henry got the part and his career took off and so the show had to end. After all, the first episode of Party Down began with Henry getting the job, so it would be fitting to say it ended with Henry quitting the job. As an aside — Lizzy Caplan’s bangs throughout season two were simply hideous.